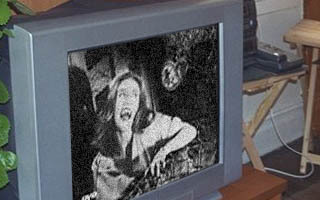 A black and white 1950s horror flick was playing on the large screen television. A woman with blonde, curly hair walked backward with a petrified look on her face in time with the eerie music. "Now this is where she falls down," Xander said, pointing at the screen. Promptly, the woman on the screen tripped over something and fell on her backside. "Cue the guy in the fake-looking rubber suit," he added, and put some popcorn in his mouth. Again, as expected, out came the monster in a ridiculous looking costume that resembled papier mâché more than rubber. It loomed over the scared woman who began to scream as it grabbed her. "Here comes the cut away, riiiiiiiiiiiiiiiiiight now!" Xander turned proudly to where Willow sat holding a bowl, absently putting popcorn in her mouth. "Ya always ruin it for me by telling me what's gonna happen," she teased and tossed a piece of corn at him as the two sat alone on the sofa in his apartment. "Well, I just try to warn you so you don't get too scared," Xander said, picking the popcorn off his chest and popping it in his mouth. Casually, he put his arm around Willow over the back of the sofa. "You gotta admit, everyone loves the monster mayhem cliché." "Xander?" Willow asked giving a nod to his arm. "What? I'm not allowed to snuggle up with my best bud when she looks like she could use a hug? You do realize that in order to lead a happy life everyone needs at least ten physical contacts a day." "Yeah, lemme hear your body talk, Baby," he teased wiggling his eyebrows which made Willow chuckle. "No, not that kind of physical. The ten touches can be anything – a pat on the back, a stroke on the arm, a quick squeeze on the knee. I just think we've both been a little deprived lately." "And how do you know all this? Some pick-up idea in a men's magazine?" Xander shook his head. "Nope. Skye actually." Xander smiled again. "She wasn't helping me pick up women. I was helping her study one of her psycho chapters." "Psych, not psycho," Willow corrected. "Whatever. Point is, for people to feel well adjusted and happy they need human contact. And since we both qualify as human and could use a little TLC, I figured what the hey! But if it bothers you Will…"
Willow grinned and rested her head on Xander's shoulder as she put her hand on his knee. In response, he kissed the crown of her head and tightened his hold on her shoulder. "Oooh! Commercial's over! Back to the action!" he said excitedly. A demon backhanded a shadowy figure and loomed closer, but the person began to scurry away on the ground. Large and bulky, the creature stalked nearer, but the person managed to jump up and take off into a run. The figure ran around a corner, face hidden in shadows, peeking around the side to see if the demon still followed. A voice suddenly echoed down from the fire escape above. "I guess this is proof the freaks come out at night," a vampire called down toward the scared person who was shaking and breathing hard. With grace and no fear, the vampire jumped from the steel cage suspended against the building and landed on both feet. He grabbed the trembling person by the jacket lapel and whipped her around. "Where's our promised land, huh Bonnie?" the vampire taunted. 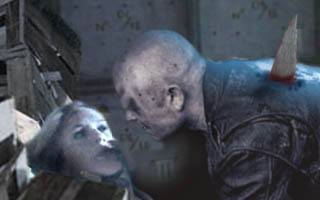 Bonnie, battered and bruised, pushed him away and began to stumble backward looking for a means of escape as she moved. "You've got nowhere to go now. Just like my friends in that damn hole. Where's the big payoff? Where's our reign of this city?" "It wasn't supposed to happen this way," she said, her voice shaking. "Instead of dining on the best people of the world, more and more Watchers and Slayers infest this city. So if I can't have the best, I guess it's back to settling for scum." He shoved Bonnie to the ground and she crashed against a tower of crates next to a dumpster. Garbage and debris settled around her. Before she could get back on her feet the vampire descended upon her. But at the last moment, she grabbed a piece of the broken crate and shoved the wood deep in his heart. He looked down for an instant. "Damn," he sighed before exploding into dust. Bonnie coughed as she got to her feet only to see the demon that was first chasing her had finally caught up and she vaulted over the debris, running to the main street. She looked left and then right and spotted two taxis parked in front of Gund Arena. One cab was running with the door open as the driver chitchatted to the other driver parked in front of him. Wasting no time, Bonnie raced to the car and hopped inside before the driver noticed. Upon hearing the tires squeal, the cabby turned and gave chase. "Hey!" he yelled as Bonnie sped away. "Call the cops!" he ordered his friend who immediately grabbed his radio microphone. 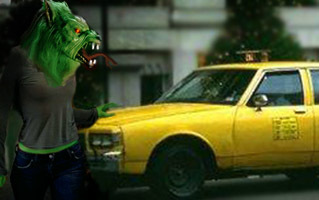 Bonnie did a U-turn cutting off traffic and headed back down the alley toward the demon. Once the creature was in her sights, she tromped the gas. The demon looked around for a place to escape in the narrowing opening. "Not so tough now, are you?" Bonnie remarked. Bonnie gripped the steering wheel and closed her eyes as the cab slammed into the demon. The taxi shook at the impact and lifted to one side as Bonnie rolled over him in the stolen car. She quickly reopened her eyes after the impact to find he was no longer in her line of sight. She slammed on the brakes before sliding back into the main street and avoided side swiping the traffic there. With the car idling and giving an eerie echo off the alley walls, she began looking in the rear and side view mirrors, but saw nothing. She released a heavy sigh when suddenly the demon popped up next to her as he shattered her window.